Here's to trips you'd never take unless someone invited you! A long time talked about trip finally became a reality late last year when my stepdad and mom invited Zeke and I on a Christmas journey to Austria. The trip would turn out to be, car-less (GASP - for us with the souls of road trippers) and centered around time in two cities; Vienna and Salzburg. To be honest, Austria was never on my wish list as a destination - mostly due to my perceived impressions of the food being well, mostly brown and full of gluten. Despite that last part being rather correct, visiting Austria was a delight and I enjoyed parts of it so much - it might have just made the to-return-to list. The best holiday markets are the small ones found unexpectedly in alleyways or small squares. While the large ones have the pomp and flash, the small ones have the most character. If you're gluten free, it won't be a walk in the park - except if you're looking for cake in Vienna. Then, you'll definitely be able to get your sugar high on. Also, in terms of grocery shopping - choose a health food store or a Billa over a Spar. Spar carries a very limited selection and only of their own line of products. At Billa's and health food stores you should be able to find Schar products and other well labeled items - even if the selection is still limited. The best spots on the train are most definitely found in Business Class - where the compartment style groups of four are located. Also, reserve a seat - if you don't it's darn confusing where to sit. 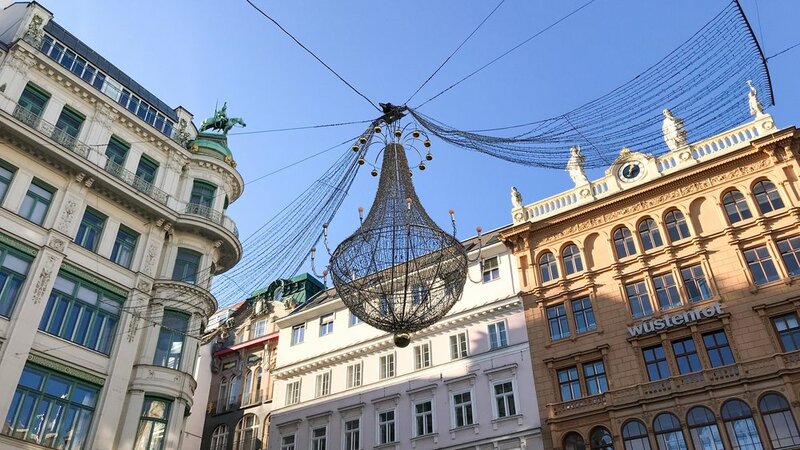 Markets and grocery stores completely close down, even in Vienna, from December 24-25th. Do your shopping on the 23rd or before. Beds larger than a twin come with two separate, twin-sized, comforters on them in lieu of one large one. Also, there are no top sheets, just a bottom one. While at first I was a bit unsure of this situation, I actually learned to love it and plan on moving towards something similar at home (if only to have less laundry). Cafe's in Austria are not like cafe's in the states; you wouldn't settle down with a book in a comfy chair and read or work for a period of time. They're more restaurant-like affairs and at least the way it felt to me was that it would be inappropriate to linger for hours on end taking up the table space. DOGS IN CAFES! I'm not sure if it's legal or simply tolerated, but each time we visited a cafe with a pooch also visiting, I absolutely cooed with joy. Oh how I wish this was legal in the states! First though, let me focus on food - because it was really very good. Starting with cafes, Allergiker was a cute little owner operated spot with a great big lump of a dog named Lund. Cafe Mozart was touristy for sure, but made for a fun, history oriented Christmas Eve dinner of salad, cake, and hot chocolate. Seriously, the place has loads of history, but expect a line to get in. It's worth it and the service is top rate. 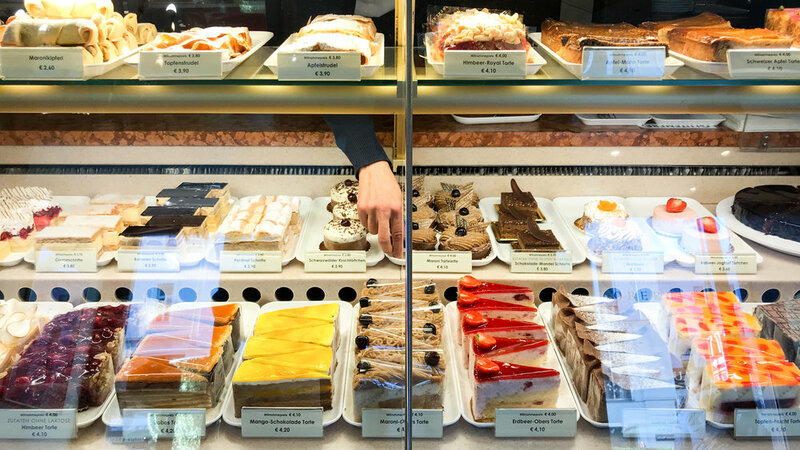 Rounding out my selection of cafe's in Vienna is Kurkonditorei Oberlaa which is really just about cake, despite the fact that they also serve regular food. They have a number of gluten free cakes and treats with the Höllander being my absolute favorite. It's globe of delicate chocolate mousse with candied orange bits coated in roasted almond slices, topped with a soft meringue and a candied orange segment. This spot also gets busy, but pro-tip; just get a bunch of slices to go and enjoy wherever you like! Next up, the cream of the crop; Zum Wohl, Simply Raw Bakery, & Le Ciel. The first is the only completely gluten free restaurant in Vienna and the safest place to try schnitzel. Also delightful are their fried risotto balls, chai tea, and Austrian pancakes (like crepes). They have a large menu ready to please gluten eaters and delight us gluten free folks - they do get busy though so make reservations just in case. Simply Raw Bakery was basically my dream of a cute Parisian cafe where I can eat everything and everything makes me feel great. We enjoyed a decadent breakfast and warm beverages first thing in the morning after walking through the old quarter to it's adorable store front. Even better, we walked out with raw gluten free Christmas cookies for the plane ride home! Finally, Le Ciel - not somewhere we would have gone on our own given the affordability of Michelin starred restaurants, but it was an amazing meal. Very possibly the best or second best meal I've ever had with some of the best fresh baked gluten free breads and the most delicious piece of trout. If it's in your budget, I couldn't recommend it more - especially for the gluten free among you. We notified them in advance and they went above and beyond to serve safe and amazing food. Moving on to where to stay, our first AirBnB, located in the older quarter of the city, was full of just the combination of character & comfort I love so much. To enter, you pass through the large old doors you see throughout the city and walk into a courtyard. Then begins the trek up several flights of small twisting stairs - be aware there's no lift here! Inside the apartment you get some of the old walls of a former girls school showing through the fresh paint job and the quirks of a tiny hallway my hips could just barely fit through. The second apartment we stayed in was very well located for walking all around Vienna and had it's own historic quirk with an old time small elevator. 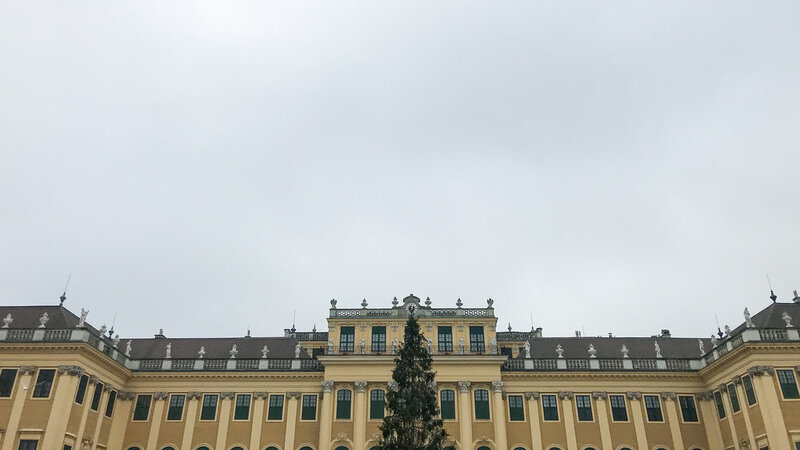 In terms of experiencing Vienna during the holidays, my absolute favorite morning was spent walking around the nearly empty streets early on Christmas Eve morning. You could hear the church choirs singing and experience the morning light shining down on the alleyways and cobbled streets. The Christmas Markets here were a bit too big for me in comparison to the ones in Salzburg, but in an interesting experience nonetheless. Ok, now let's talk Salzburg in a nutshell; I LOVED the city, it's general near the mountains vibe, Christmas Markets, and our hotel was just about perfection with it's smartly put together rooms and wonderful amenities. What didn't I like? Well, finding safe gluten free food was just about impossible for someone who doesn't speak German. Aside from one cafe that was my saving grace, I basically lived off some delightful Schar brioche bread I got at the local health food store, butter, apricot jam sweetened with agave, cheese, and sausages. I'll start with the Hotel & Villa Auersperg. It's on the opposite side of the river from the older portion of the city but that just makes the walk all the more lovely. We had the second least expensive room in the Villa building - a corner with big windows opening out to the neighborhood. While a small space square footage wise, it couldn't have been more thoughtfully designed with cubby holes and storage fit for a good week long stay. The bathroom, built inside the main room with windows making up the top foot and a half of the walls (the light! ), had lovely heated floors ideal for drying out wet boots. Now for the other amenities of the hotel... In the main Hotel building there is a spa area available for guest use at no extra charge. Here's the kicker, the dry sauna has windows looking up at the mountains. You can literally lie back and watch the stars and the mountains in the evening. It's absolutely lovely. Also found in the spa area is a quiet lounging area with tea and other beverages, offering a space to meditate, get your yogi on, or just read. For warmer months or tougher souls, there's also a outdoor patio space. 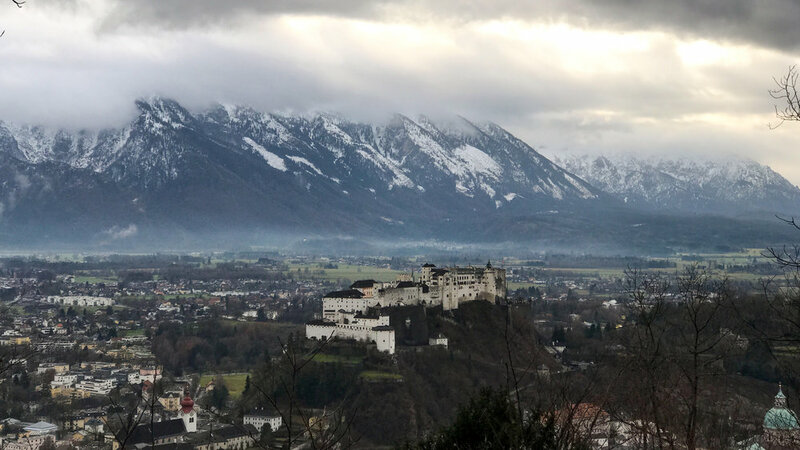 We tried to eat at two other restaurants while in Salzburg, one made me feel a touch sick, and the other scared me off with what seemed to be a lack of full understanding about cross contamination - an anxiety attack ensued. Thank goodness for my understanding and lovely family & a very comfortable & historically interesting hotel lobby. The one safe spot I could find in Salzburg was the Heart of Joy Cafe. We couldn't come up with the full story on it, but it appears to be centered around the spiritual practice of one particular individual with all options being either vegetarian or vegan. They make a lovely chai latte and had plenty of tasty gluten free savory meal options as well as a delicious chocolate mousse cake. We returned several times. I think what made me really fall for Salzburg, in spite of the lack of gluten free options, was it's walk-ability. We spent our two full days here walking up and down the hills and alleyways of the city and across the river that runs through the center. The dreamiest adventure was up through Kapuzinerberg, a hill park rising just down the street from our hotel. We set off on our journey with the possibility of a Christmas Market being found at the top in Franziskischlössl, a small hilltop castle. It was a bit of a trek, with quite a few stairs, but at the top the reward was the most perfect Christmasy experience I've ever had. An outdoor courtyard tastefully decorated with holiday music, roaring fire pits, and tables with wool blankets set on each chair. The Christmas Market itself was small and mostly filled with locally made provisions and warming beverages, but frankly that's probably what made it so chill. It was a place, unlike the cafes, where you could really settle in for awhile and enjoy the experience. As a final though on Austria, I highly recommend reading up on the history of the country before visiting. Perhaps it's because of my own personal Jewish heritage (recently genetically confirmed as 90% European Jewish on my dad's side + some surprise Ashkenazi on my mom's side), but learning about it added a deeper layer of understanding to the complexity and tension that still exists in the country at large. Especially after noticing that much of the Austrian historical/educational signage had a general tendency to minimize the less than pleasant history of Jewish people in the country. Lonely Planet's Austria guide book offers a good overview of general Austrian history with particular attention payed to the history of Jewish residents of Vienna over the many years they inhabited the city. If you'd just like a quick jolt of history, the movie Woman in Gold, offers a heads up at some of the more recent real life events and history relevant to the story - just know the story is much deeper and much longer than what the film portrays.